Polymedia Event Theatre Dome Cluster, with construction crew. To design and construct a new Polymedia Event Theatre (PET) and undertake a proof-of-concept public event. Aim: To realise the design of a new Polymedia Event Theatre (PET) and to undertake a proof-of-concept public event. This PET is the third project in a series of Event Spaces designed and constructed by me in collaboration with others. The industry partner that is involved is a leading Australian inventor whose products solve specific problems that have previously impeded the development of the PET proposed. This new PET will make possible the touring and public presentation of new polymedia works, including multichannel sound and video as well as kinetic sculpture and performance; work not previously possible to present adequately, for the reasons outlined below. In order to contexturalise the work proposed in this application, I summarise the two earlier space designs. Details, including photographs, of these spaces can be found at Polymedia Event Theatres. PET-1: The Bicentennial Dome project began in 1987 to construct a portable geodesic space in which to perform original audio-visual works. The polymedia performance group Floating Exceptions (directed by Worrall) designed and constructed the space which was used in Bicentennial events and subsequently also in an Adelaide festival in 1989 and then numerous times it Canberra for concerts, exhibitions, broadcasts and other events. This dome is a 7 metre radius geodesic hemispherical spaceframe with a single-piece white Kevlar canopy. Internally it was outfitted with sixteen channels of sound and five projection screens. With a seating capacity of two-hundred, it requires ten people overseen by a rigger one day to erect or dismantle. After twelve years of service, the Canopy eventually succumbed to weathering, wear and tear and the dome was retired. PET-2: The Floriade Domes. The Bicentennial Dome had intentionally been over-designed. Following its retirement, I produced two more-optimally designed interlocking portable spaces. With sponsorship from Arts ACT and a number of regional businesses such as One Steel, Apple Australia and Telstra, I led a team to produce Alien Garden, a large scale polymedia work (20 channels of sound, 8 projectors, kinetic sculptures etc) for the Floriade festival in 2003. This event ran continuously for six weeks and was visited by 30,000 people. Subsequent to this, the larger of the two domes has been employed for other performance events, such as the 2004 Sonic Connections Festival at Wollongong University. 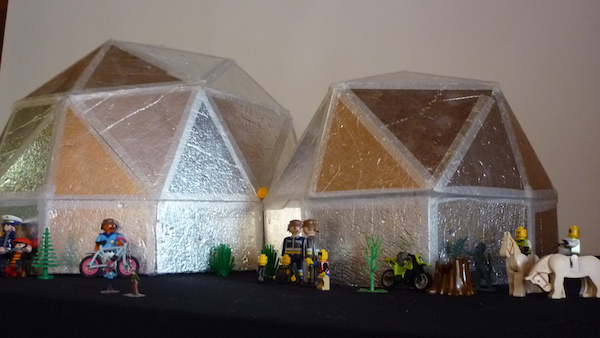 These domes consist of a 4.6 and 2.8 metre radii geodesic 5/8th spheres with a two piece black sailcloth canopy. Internally it was outfitted with twenty channels of sound and four large projection screens. With a seating capacity of one-hundred, it requires three people overseen by a rigger four hours to erect or dismantle. While lightweight and portable, the strut and canopy arrangement is quite labour intensive and requires an erection team with specialist skills. This has meant that it has not been possible to accommodate the many requests from others to use the space for their own programmes. In PET-1 and 2, the canopy was by far the most complex and expensive component both in terms of materials and construction. For PET-3, a few large pieces is necessary for structural integrity and internal climate control and this mitigates faster, cheaper and easier transportation and erection. The experimental prototyping (above) with such factors as mass (weight) and colour (to achieve opacity for image projection) and climate control (air conditioning) have been convinced me that the strut-and-canopy approach is not worth pursing. Another difficulty with those designs is their susceptibility to security breaches. Unfortunately, the collection of a large amount of electronic equipment in the one place has proved to be a magnet to thieves and even with active grounds patrol, a knife-entry break-in through the canopy and consequent theft is another factor that has convinced me to abandon this approach in favour of a panelled approach. The work planned for this project is to collaborate with two industry partners to overcome the issues raised above using their technologies so as to build a new PET, and to present a proof-of-concept public event.. Specific design challenges that will be addressed in this project include choice of panel material, joining methods and acoustic adjustment. Consist of environmentally sound recyclable materials. I have undertaken preliminary investigations of three products which seem to fulfill many of these criteria. The particular choice of material will depend on the considerations discussed next. The design of a light-weight panel structure of the same geometry as the Floriade Dome PET-2), or perhaps, depending on material constraints, one of the same size with a higher frequency geodesic breakdown. A major challenge in these type of portable structures is the way facets are joined. For strut-and-canopy structures this is resolved in the node design, of which I produced two solutions. For a portable panelled structure, no commercial solution is currently available. The intended collaboration with Mr Dean Cameron, Director of Joinlox Pty Ltd, will be to determine whether, as seems likely, his Striplox technology is suitable, and with which panelling material. A flexible canopy is almost acoustically transparent to outside noise. A panel construction has advantages such as better isolation from external noise, and some disadvantages: a more reverberant internal space that could threaten aural spatial clarity if untreated. Please note: It is not possible to outline or time-line this process in more detail at this stage as Mr Cameron's business affairs will require us to be flexible. This is a summary of a process, as agreed between us. We both are experienced collaborators and are confident that the process can be accommodated. Obtain samples of Striplox technology. Obtain three - or less - samples of panelling material and/or investigate local manufacture under agreed constraints. Worrall to visit Joinlox Pty Ltd in Queensland with some preliminary examples for design meetings and more prototype development and testing (visit 1). Purchase of materials and construction of PET-3 at Joinlox. (visit 2). Undertake acoustic testing and adjust, in consultation with Mr Philippe Doneux from Acoustica Pty Ltd. (Sydney). A public event which demonstrates the viability of the project. The PET projects are quite well known in the experimental arts community and numbers of artists have expressed interest in producing work using the space. While it is not the intention of this residency to focus of the production and touring of such an event (these will follow naturally in the years following its completion), a number of artists from diverse backgrounds have indicated their eagerness to be involved in this event. Some testimonials to that effect are included in the accompanying documentation. Mr Dean Cameron MD of Joinlox Pty Ltd (Brisbane) has recently won the ABC's New Inventors prize for the second time with a product that is a potential solution to our panel-joining problem. Joinlox technology is being used to save transport and other costs by making large structures, such as water-tanks, transportable in a collapsed state to be constructed on-site. Mr Cameron is interested in using geodesic geometry for other applications so Joinlox Pty Ltd stands to benefit peripherally, by extending the range of applications, and thus markets, to which their technology can be applied. See attached letter of support. Mr Philippe Doneux, MD of Acoustica Pty Ltd. (Sydney) is and acoustic engineer and an ABC New Inventor's Award winner for a revolutionary new product called Quietwave. He has agreed to act as an advisory consultant on this project in an honorary capacity. Various artists involved in the POC including Ruth Allen (glass), Marian Theloucataris (sculpture), Stephen Duke (animation), Ros Bandt, Greg Schiemer, Warren Burt, Brigid Burke (and others) (music).